Los Gatos, CA, August 23, 2015 – The wearables market in the US from 2014 through the first half of 2015 has shown fast growth in year-over-year volume of consumer feedback, however after peaking post-holidays in January 2015, demand growth has slowed significantly, according to a new report from Argus Insights. Over the last 18 months, the wearables market has started to mature and has grown considerably with new players entering the market with numerous products such as fitness bands, smartwatches, smart glasses, and other sensor-enabled devices. 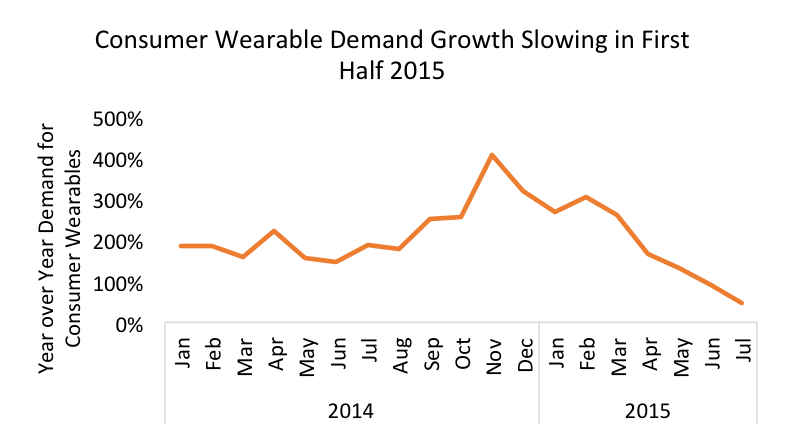 Using data compiled from approximately 328,000 consumer reviews since January 2014, the report reveals that after the holiday season of 2013, consumers briefly lost interest in wearables before steadily increasing demand reached its high point in January of this year where it was four times the level of a year earlier. Since then demand has slowed. According to the report, the Apple Watch stole consumer interest from Fitbit and other wearables at the time of its announcement in September 2014, as potential buyers waited to determine whether they wanted the Apple Watch. Interest in Fitbit devices resumed and grew once the Apple Watch details were announced, as Fitbit and other wearable manufacturers saw a strong 2014 holiday period. Since their IPO, Fitbit has continued to gain mindshare with consumers. Consumer delight, measured from the volume and the content of consumer reviews, showed that Fitbit was achieving a very high level of buzz, though the satisfaction of their consumers is dropping while Apple is quickly gaining in delight. Other surprising insights include high consumer delight scores for smartwatch manufacturers Motorola and LG, as consumers are reporting more satisfaction from smartwatches than from fitness bands..
Argus Insights is founded on the fact that mindshare anticipates demand. Through curated analysis of global consumer reviews and social media conversations, the firm provides comprehensive visibility at market, product, and attribute levels to determine what is delighting and disappointing the market. Customers take action on our insights to deliver better products, more impactful launches, create forecasts, perform competitive analysis, and track events and analyst relations. Argus Insights provides well-established and developing companies from Fortune 100 to small startups with information on market fit. We publish monthly market fit reports for a variety of B2B and B2C markets immediately at the month’s close while other firms force clients to wait a month or more for results. Take action today, visit http://www.argusinsights.com/ .